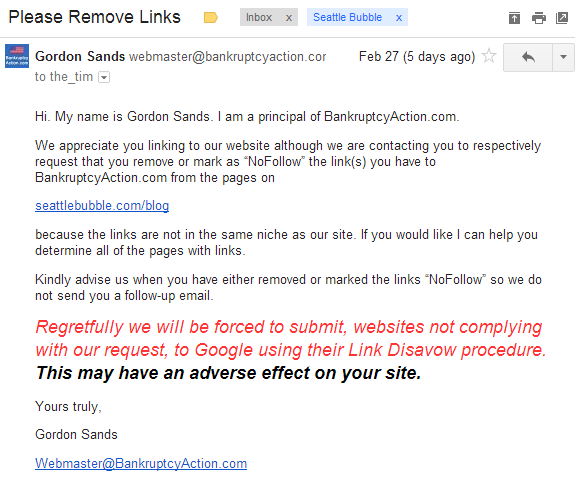 Last week I got an email from Gordon Sands, “a principal” of BankruptcyAction.com—a website I’d never heard of—claiming that Seattle Bubble contains “link(s) to BankruptcyAction.com.” The claimed reason for this random email was to remove a link on my site “because the links are not in the same niche as our site,” but the real reason was obviously that the proprietors of this site had previously engaged in link-spamming, were punished by Google, and are now scrambling to get publishers to remove their comment spam links (via BoingBoing). I especially enjoyed the big, red, bold text at the end of the email threatening to use Google’s Disavow tool as some sort of weapon against me should I not comply with his demand. 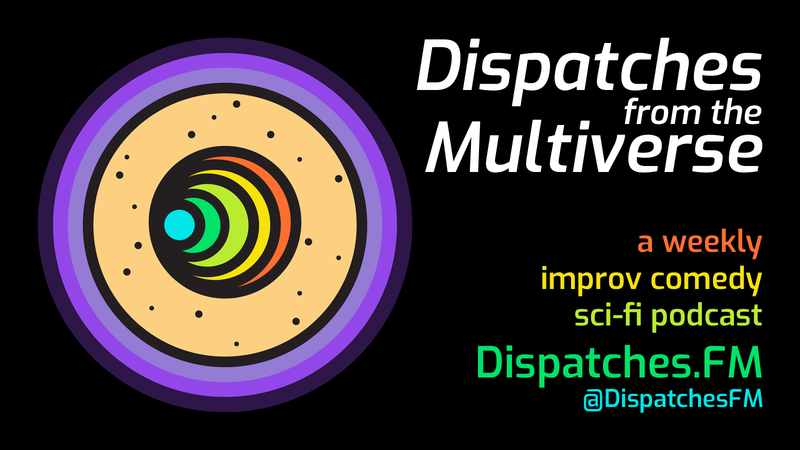 Despite the vague claim in the email (no specific link to the post or posts in question) and the unnecessary threat, I decided to look into it, because to my knowledge no spam comments have ever gotten through on my site thanks to Akismet. Since Gordon seemed to be operating under some sort of false assumption that I care whether or not BankruptcyAction.com disavows my site to Google, I thought I would clear things up for him. In reply: more veiled threats from Gordon. I thought it only fair that I give Gordon a few tips, like if you want someone to do something for you maybe don’t lead off with giant bold threats. Gordon’s final word on the matter confirmed my original suspicion: he’s trying to undo the damage done by comment spam. That the comment in question on Seattle Bubble is obviously not spam is of no concern to Gordon Sands or BankruptcyAction.com. And because apparently he felt like his threats did not go far enough, he decided to close our conversation by calling me “a sensitive woman,” which I assume was meant to be an insult. But I am the one who “can’t handle your business.” Right. Good luck to you as well, Gordon Sands and BankruptcyAction.com! You’re going to need it. Oops, I guess Gordon Sands decided he wasn’t done “wasting time” after all! @the_tim Tim needs to grow up and conduct himself properly. When someone refuses to remove comment spam you disavow the website Timmy.